DIY - 50-50 Raffle fundraiser! What it is: A 50-50 raffle fundraising simply involves the sale of raffle tickets with the proceeds being split evenly between the winner and your organization. It is one of the simplest and easiest fundraisers you can do. Where it happens: Anywhere. Many clubs include a 50-50 raffle at all their regular monthly meetings. Tickets are sold throughout the ‘get acquainted’ or informal portion of the meeting. Other groups use them regularly in conjunction with other fundraising events to supplement the profits. As an ongoing event, your group could have monthly 50/50 raffles and let local businesses such as pubs and coffee shops and boutiques sell tickets on a regular basis. Someone would need to be in charge of collecting the money and tickets from each place and notifying the winner each month from the information on the back of the ticket. What you Need: Your only fundraising expense is the raffle tickets. A double ticket roll is ideal, especially if the winners need not be present at the drawing to win, be sure to have contact information on the portion of the ticket turned in for the drawing. A single ticket roll that you tear in half can be used if the drawing is taking place at the event and the winner must be present to win. Hand-made or custom tickets could be used or a grid or board with the numbers on it could be used. How to Proceed: All you need is one or more ticket sellers. 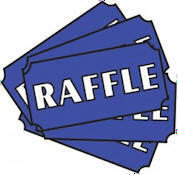 Raffle tickets normally sell for $1 each, with an incentive for multiple purchases such as 3 tickets for $2, or 5 tickets for $4, etc. Using a price incentive for multiple tickets can often increase your total sales and builds a larger ‘pot’ to split with the lucky winner. All ticket stubs (or duplicate tickets or numbers, depending on your style of raffle tickets) are placed in a hat or other container from which one lucky number is drawn. The ‘take’ is tallied and one-half awarded to the holder of the lucky number. The drawing is normally held toward the end of the meeting or event with the lucky number holder needing to be present to win. If not claimed within a set time limit which can be as short as a minute or two, a second number is drawn and awarded the prize. Or alternatively, once a month (or any set time frame you choose) if you have multiple places where people can purchase tickets and winner need not be present to win, in which case the winner is notified via information on the winning ticket. Generally speaking, the larger the prize, the longer time allowed for the original winner to claim his or her prize. Return on Investment: In a 50-50 raffle fundraising, your group gets to keep exactly 50% of all the money raised. At a large function, with a sizeable pool of money expected, multiple prizes of perhaps $100 or more could be awarded. Whatever the prize split, it should be determined ahead of time and used as a sales incentive. (i.e. “Buy a $1 ticket and get 5 chances to win $100). You can also consider a 60-40, 70-30 split, etc. but 50-50 seems to be the most popular split. The profits can be earmarked for an individual ongoing project, or included with other funds raised for your main charitable goal.